As most young adults make the transition from living at home and going to school, to getting their own place and landing their first jobs; many of their parents are starting to make the transition from working full time to retirement. This can be a challenging time for both parties, but if you arm yourself with the right tools both can be successful. As a young adult, it is essential that you talk to your parents about personal finance early and often. You want to make sure that they are prepared for what is ahead, so that they can feel secure in their retirement. AARP currently estimates that adult children are providing, on average, $2,400 a year to help their parents in retirement. This could be in the form of care or help financially. Without sounding harsh, here are some simple steps you can take now to avoid spending all your money on your parents later. 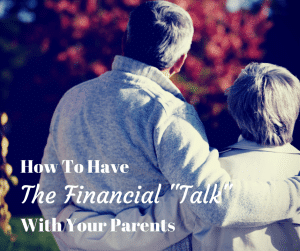 The first step is to make sure that you talk to your parents about their finances. Are they prepared for retirement? Are they depending on Social Security? Do they have a budget of monthly expenses, and does their income meet or exceed this? Do they have a will, trust, power of attorney, and advanced health care directive? If not, you should remind them the importance of drafting these documents up. You don’t necessarily need to know the details, but you should know where these documents are located in case you need to access them, or you should keep a copy at your house if you are distant from your parents. 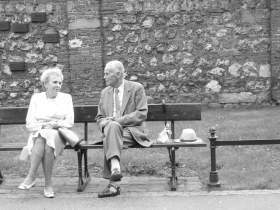 Do they have long-term care insurance or life insurance? If they don’t have long-term care insurance, you should highlight the current costs of long-term care, and ask them if they have enough in their estate to pay for this. If not, it could be a solid investment. And just like a will, you should know where their policy documents are located. Also, you want to be aware of any life settlement investments they may have. Where are their bank and investment accounts, and are you, or their executor, listed on the power of attorney? Many couples simply name their spouses as the power of attorney, and never think about it again. As your parents age, it may become important for you to access their accounts from time-to-time. This may be the hardest part of the conversation, but it is good to figure out a plan should they need extra help. Maybe a reverse mortgage could be something to consider. Talking about wills can be uncomfortable on account of the touchy subject of who gets what. That being said, this is a conversation that needs to be had as soon as possible. You don’t need to know what’s in the will, but you definitely need to be aware of the fact that your parents do indeed have a will that’s ready to be implemented in the event that anything should happen to them – and you need to know the location of it (i.e. file cabinet, safe deposit box, etc.). So, what exactly goes into creating a will? There are a lot of misconceptions on this subject from how many witnesses need to be there at the time of the creation of the will to the necessity of an attorney during the whole process. Writing a will, also referred to as estate planning has been thought of as a rich person’s activity. This couldn’t be further from the truth since most of our parents may have amassed a decent legacy by the time they’re in their 60’s or 70’s. The person writing the will should be over the age of 18. Your parents should be of sound mind and judgment at the time of writing their wills. They will need to sign the will in the presence of two witnesses. A will’s executor is the person charged with the responsibility of making sure that the individuals named in the will get what’s left to them upon the demise of the will-writer. In addition, a will executor is responsible for paying taxes on assets such as property in the document, taking care of trusts if some of the people named in the will are below the age of 18, settling debts and taking inventory of all assets. Ask them to choose their executor carefully since the law demands that these individuals be over the age of 18, and not have been convicted of a felony. Your parents should know that it is their prerogative to choose anyone, even an attorney or accountant to act as an executor. In fact, some banks and financial services companies even offer this as a service for a fee. Do They Need an Attorney During Will Creation? While it’s not necessary to have an attorney present when creating your will, advise your parents the importance of having one should they have a collection of assets that they may have trouble dividing amongst to the individuals named in the will. Also, remind them that it’s important for them to keep reviewing their will so they can keep up with life changes such as marriages, the birth of children, the death or withdrawal of an executor from the will, the acquisition of additional assets and more. Many families will want to consider setting up a family trust in order to avoid probate. Putting all major assets, like investments and a house, in a single trust, make it easier to decide how these assets are handled upon death or disability. It’s that second part that’s also key. Families can setup trusts in case of disability – when a child may need to have access to money and assets to help support the parents. One you have a trust created, the important part is making sure it’s fully executed. This means actually transferring the assets over into the trust. Many lawyers will help with real estate, but most other assets (like investments) will require special forms from the company that manages them. If you remember a few years back when James Gandolfini died, he hadn’t full executed his trust, and the result was paying millions more in taxes than he needed to. In many cases, a solid will and trust can be created and executed for around $1,000. Then, you can also find an online broker that services trust accounts. The next thing you need to talk to them about is insurance. Let’s face it; care is expensive, and long-term care can drain your finances faster than you can put two coins together. Insurance options for retirees are as varied as they are affordable. To begin with, ask them what types of insurance they have at the moment. This will help you take stock of where they are and what needs to be done to tie up loose strings. Chances are that the insurance they had pre-retirement may be discontinued once they reach a certain age. Medical insurance in the form of Medicare may also not be enough to pay for regular doctor’s visits and more. The last thing you want to do is to have them dip into their savings to pay out of pocket when it comes to seeking any kind of treatment. If this happens, there won’t be much left in way of taking care of their living expenses, and this might snowball into a situation where you’ll be forced to chip in to help out with these expenses. Medicare usually kicks in at 65, so if your parents are uninsured before this age and decide to retire much earlier, you might want to look into alternative options. Healthcare after retirement can be costly, and you may be left paying premiums of up to $552 if under 65. This number drops to about $227 after 65 on account of the fact that Medicare kicks in, cushioning you if your employer was accounting for the $552 a month before this age. In addition to Medicare, ask your parents to look into alternative options such as Medigap, and Medicare Part G which offer a little bit more to help them to purchase medication at an affordable price should they need it. If you’d like to help your parent navigate through the health insurance maze, consider speaking to an independent health insurance advisor who can help them get the best deal in relation to their circumstances. Also, make them understand that the amount and type of health insurance packages available to them will rely on how healthy they are at the time of application as well as the existence of any pre-existing conditions. It’s important to do exhaustive research because some insurance providers may have relaxed demands regardless of a person’s health condition. Life insurance, on the other hand, isn’t as complicated as health insurance. To begin with, ask your parents to consider taking one policy out each so that you as their child as well as your siblings and other dependents are assured of a financial cushion should they die prematurely. This can, in a way, be looked as inheritance depending on your outlook. Life insurance is ideal for parents who haven’t built up financial assets over the years, or young adults who have children that look up to them for their upkeep. Contrary to popular opinion, your parents won’t need life insurance for the most part of their lives if they’ve made other financial arrangements that they are satisfied with from the get-go. Cash-value insurance – this type includes universal, whole and variable life insurance, all of which have an investment component affixed to them in the form of a cash value. Whole life insurance is basically combines an investment fund as well as a life coverage. When you die, the insurance company pays out a fixed value to your dependents depending on the amount you had paid off in terms of your monthly premium amount. Universal life insurance, on the other hand, is a type of insurance that is more fluid since it combines term insurance with an investment in the money market as preferred by the policy holder or advised by the insurance company. Variable life insurance is a policy which takes advantage of investment funds that dabble in stock or bond mutual-fund asset investment. There are no guarantees of a certain amount of money during payout due to the sometimes unpredictable nature of the investment markets. Term life insurance may be the most ideal type for your parents due to its flexibility and the option of walking away from it after certain number of years. This type of insurance allows you to choose a specific block of time that you feel that you need coverage. This can be helpful for parents who are saving up money in another account for a certain number of years and have a certain end date for their saving schedule. Once your chosen time block expires, one can take their money and cash out. If the person taking out term life insurance dies within the time that the policy is active, beneficiaries get their due. If, however, they die after the expiry of the term, there is no payout to be had. The amount of insurance premiums your parents may have to pay largely depends on factors such as their health at the time of taking out the plan, their age, the duration of time taken out to pay these monthly premiums and whether or not their policy has an investment component tied to it. Lastly, ask your parents to take out a policy that will be able to pay out an amount that’s equal to seven to ten times their annual salary. Don’t know where to start? Check out this great resource on choosing insurance. The main goal of investing is to have money in retirement. Just because your parents aren’t able or don’t want to work after a certain age doesn’t mean that they shouldn’t have a couple of income streams that earn them a passive income. Ask them to start investing as early as possible so they’re able to reap the benefits of compounding interest over the years. In addition, they should have a clear plan of what they intend to do post-retirement since this will inform their decisions when it comes to how much they would like to invest. That being said, they should take advantage of all savings and investment opportunities that come their way. Here’s a great retirement calculator should they be on the fence when it comes to how much they’d like to invest going forward. The issue of taxes after retirement is a touchy one due to the fact that not a lot of parents will have as much income as they used to when they were working. Because of this, impress upon your parents that it’s imperative for them to put as much money as they can into 401 (k)’s so they can have more money when they retire, freeing them up to enjoy life without having to worry about how much they will need to make it through their golden years. When it comes to your parent’s retirement, preparation is everything. They may not have this information right now, so please feel free to share this post with them. At the end of the day, you want your parents to be as financially comfortable as they can as they get ready to enter a new chapter of their life. The goal should be, in tough times, you already have these questions sorted out so you’re not adding to your grief. Readers, have you had “The Talk”? Any advice from your experiences? Anything I’m missing? I would recommend establishing a relationship with an elder rights attorney. We used one when my dad looked like he might be in a nursing home longer term following surgery. Turns out he is now home but is battling Alzheimer’s. At least now, there is a plan in place when the time comes for him to be admitted the next time. That’s a great call. You need to plan for these things before they are diagnosed with something like Alzheimer’s. Once they are diagnosed, courts could dismiss future wills and trusts as not valid since they may not have been able to sign for themselves. That’s a hard conversation to have, when the roles become switched from child to parent. I’ll have to have it one day with my dad one day, who I now see making some not-so-wise investment decisions. I hear you on the tough conversation part. It is better to start earlier than later, especially if you already see poor investments occurring. You don’t want him to be taken advantage of. I told my Mom on Sunday to consider moving to Costa Rica when she and my step dad retire. They have absolutely zero retirement savings. I told them that they can live off social security and be poor in America, or live off the same amount in Costa Rica and be middle to upper-middle class. They are thinking about it. They have about 15 years until retirement. Interesting…I watch a lot of House Hunters and a lot of retirees seem to be moving there because of the cost of living. I have never had to deal with this problem. In fact my parents go overboard the otherway. They are always updating us on their situation. It’s good I know but I just don’t need to know that often. My mother-in-law is very much like you describe. She is almost over-insured because she wants peace of mind for everything. I tried that and my mom told me to do a DIY well at nolo and how she does not need a will because Ca says I am her heir. I tried to point out about probate but it did not work. Sometimes you just can’t help. Sometimes you can’t help…at least you tried. You should get your mom to watch a show like Suze Orman. It seems like every night someone calls in with your exact situation. Great tips. I helped my dad with some of the math on his recent mortgage refinancing. He asked me which of three options was the best deal for him in the long term. Way to start earlier rather than later. The more involved you are, the easier it will become!